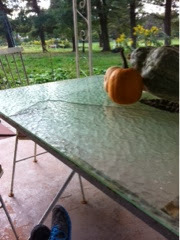 In an effort to cram too much into a recent day, I managed to crack the glass table top on our outdoor dining set. Purchased via craigslist just after we moved to the farm, this metal table and chair has seen lots of use. Just outside the kitchen door it is an easy spot for breakfast, lunch, dinner, snack. I had cooked a pot of something. The pot was hot and it was late at night. 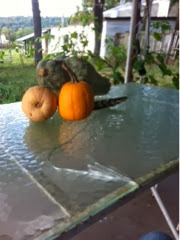 The pot was way too hot to put in the fridge so the cool back porch seemed like a great idea. It seems like it has been done before. Probably with a cooler pot. Now, I wonder, where can I find a replacement piece? Have never seen that on craigslist.